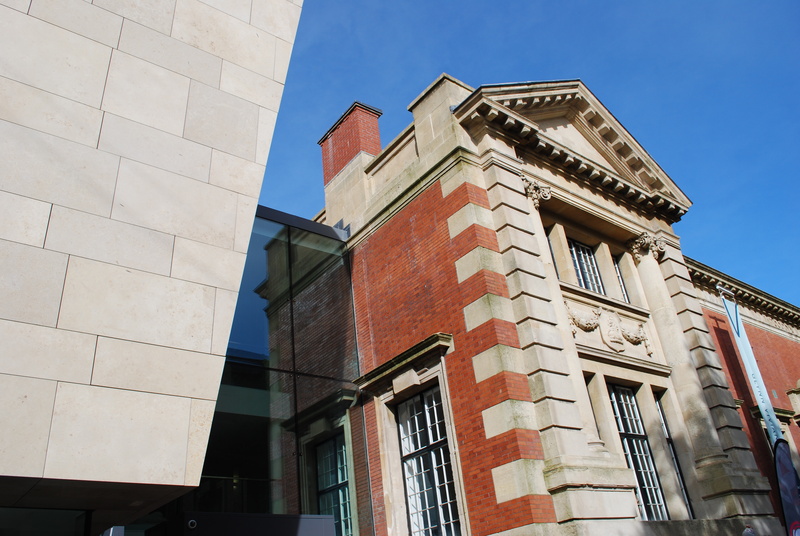 For five years the façade of the Glynn Vivian Art Gallery has been hidden by tall wooden hoardings. A week or two ago the screens came down, and yesterday, at last, the ‘new’ Glynn Viv opened its doors to the public. 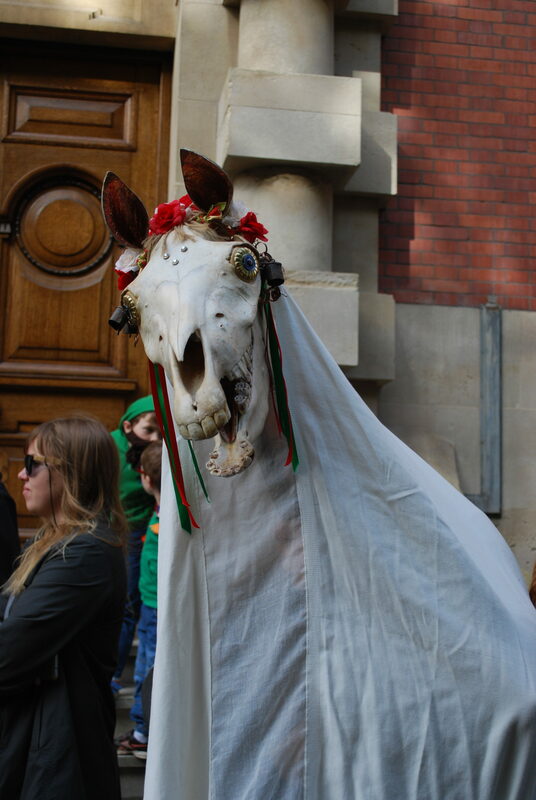 In the morning a long parade of people walked through the city centre to the Gallery, many of them in costume, including a striking, out-of-season Mari Lwyd. When they reached Alexandra Road the paraders lined up, the Mayor made a short speech and cut a red ribbon, and the first members of the public flowed in to rediscover the wonders inside. It was a joyful moment. From the steps of the College of Art opposite, the front of the Glyn Viv building gleamed in the autumn sunshine. The style of Glendinning Moxham’s original 1911 building sometimes gets called ‘Edwardian baroque’, but this is wrong on two counts. Edward VI was dead by the time the Gallery opened. And although the façade does have a fancy cartouche above the front door, the building is otherwise calmly classical, not baroque. Its bold use of plain red brick is positively austere. Everything’s been beautifully cleaned and you can make out all the details clearly. John Newman in the Glamorgan Pevsner calls the building a ‘masterpiece’, and seeing it today as it must have looked, brand new, over a century ago is thrilling. In a city peculiarly empty of well-designed public buildings we should cherish it as it deserves. In 1974 a windowless extension was added on the left of Moxham’s building. Newman is polite about it (‘does nothing to impair Moxham’s facade’), but its heavy, rough concrete face always looked hostile. Now this has all changed. The new architects, Andrew Nixon and his colleagues at Powell Dobson, have completely transformed the extension. They’ve remodelled and refaced its frontage, so that it now looks sleek and blade-like, and they’ve re-connected it with the 1911 building by inserting an elegant glass-faced link, horizontally at street level and vertically up three floors. At last the two contrasting blocks work as a harmonious whole. The glass link has allowed the architects to move the entrance to the Gallery. Instead of climbing the stone steps through the original front door or meandering up the ramp in the garden on the right, you can now walk straight in off the pavement into a new foyer. This is a bright and welcoming area – it has a large reception desk, a small shop and a café, with proper coffee machines, run by Coast Café – and it’s the ideal friendly introduction to the Gallery. Turn right up some steps and you find yourself in what has always been the Glynn Viv’s great glory, its balconied hall. It’s a pity that the hall’s ground floor is so completely filled with the temporary installation by Lindsay Seers, ‘Nowhere less now’ – the upturned hull of a large boat housing a video. This makes it impossible, for the time being, to re-appreciate fully Moxham’s great design, with its pillared balcony and sculptures, its skylighted barrel ceiling and its giant consoles. Off the hall, the old learning room is still a learning room and beyond it is a new large, beautifully lit lecture and meeting space. I’m certain it will be well used. Finally, the old entrance area is what’s described as a ‘welcome area’, although it’s too far from the new entrance to be one in reality. Yesterday it housed live music. Climbing the main stairs you reach the balcony. In the old days both long walls were filled with cabinets of pots. Now they’re to be seen only on one wall, the other being empty. In fact quite a lot of usable space is unused, and I wonder if ‘white box’ thinking hasn’t sometimes been taken a bit too far. Midway up the stairs to the balcony are several walls, needlessly blank: on one of them used to be my favourite painting in the permanent collection, Ruins in Naples by Thomas Jones Pencerrig, alas now banished to the stacks. Similarly, the top-level glass link area is completely empty, except for a sofa: it’s a good space for quiet meditation, but a small amount of visual stimulation wouldn’t harm. The pottery is displayed brilliantly. The cabinets are handsome, the lighting couldn’t be bettered, and the pieces are well spaced; pots in galleries usually suffer from congestion. Anyone interested in porcelain, locally and internationally made, can’t fail to be impressed (though it would be good to see more contemporary work). On the left, Room 9 houses the Leonardo exhibition. It was a shrewd move to persuade Windsor Castle to lend ten of its Leonardo drawings to coincide with the opening. Spaced well apart in darkened mystery, they’re bound to attract many visitors, and the College of Art is planning a ‘Leonardo Day’ in November, with a lecture by Martin Kemp. Room 8 has more loans, this time from the Tate’s collections, including a 1955 Picasso painting, The studio and Mark Gertler’s 1911 portrait of his large-handed mother. Just as interesting, though, are paintings from the Glynn Viv’s own collection: a Ceri Richards and a lovely picture by Brenda Chamberlain of Dora Maar, Picasso’s partner. 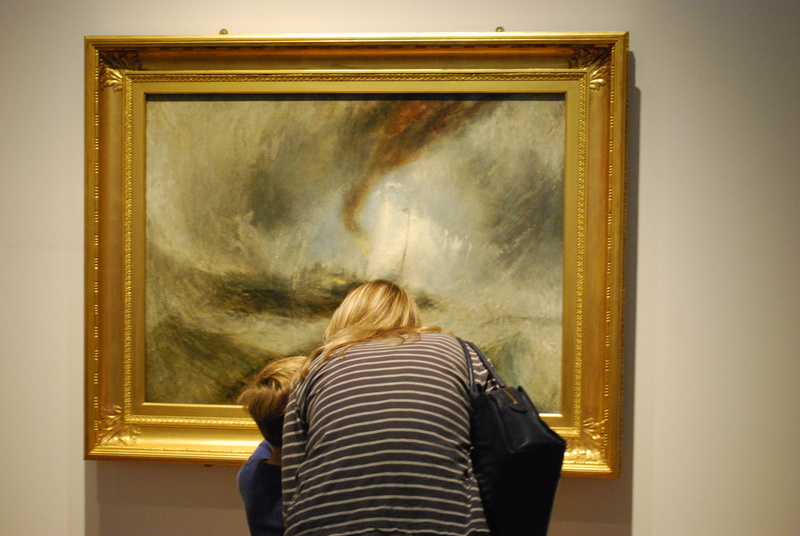 Another Tate loan, Turner’s great swirling Snow storm (1842), is displayed alone in a niche on the other side of the balcony. 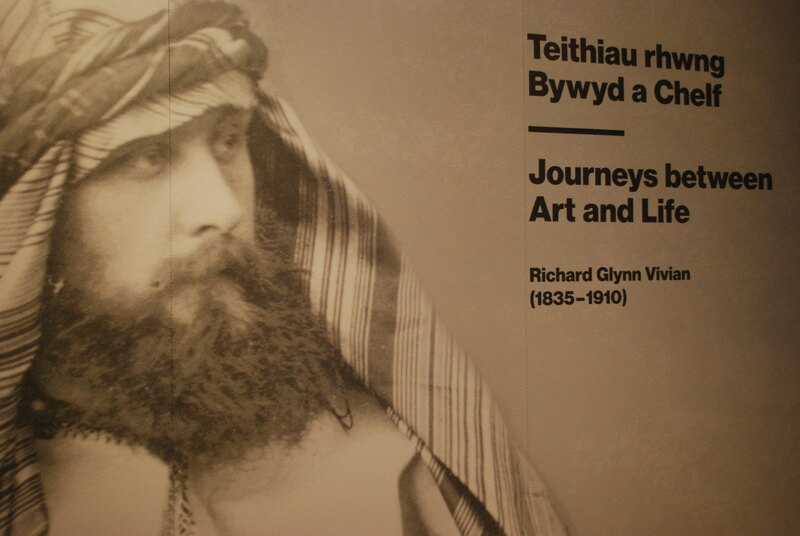 Then come four spaces, Rooms 4-7, devoted to Richard Glynn Vivian and his foundation collections. Their contents are a mixed bag: fans, sketches and notebooks, paintings, Japanese prints and books and pottery. 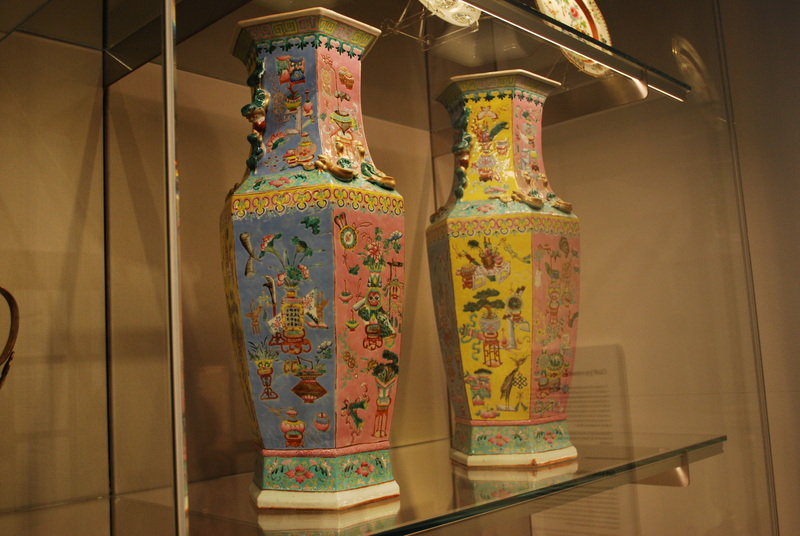 Two polychrome Chinese porcelain vases look as if they’d been made yesterday, by Grayson Perry. Room 7 is the only space in the Gallery entirely devoted to paintings – and the only room that doesn’t quite work. One wall has the wonderful big portrait of a young lady by Bartholomeus van der Helst (c1640-45), which come into the collection long after Richard Glynn Vivian’s time; on the others are minor, uninteresting classical paintings collected by RGV, and copies made by Penry Williams (PW made some extremely interesting pictures but these are not among them). Collectors – their character, travels and presumptions – are certainly interesting. An image from RGV’s visiting card, of him dressed, à la T.E. Lawrence, in Bedouin kit, is used tellingly as an introduction to the rooms. But in the end the collecting is not as interesting as the objects themselves, and as a librarian – librarians always seek to give ‘everything to everyone’ with minimum intervention – I’m always suspicious of excessive ‘editorialising’ in museums and galleries. Personally I’d have swapped one or two of the RGV rooms for more paintings and other works from the Glynn Viv’s wonderful 20th century collections, and I suspect I’m not the only returning visitor who misses Alfred Janes, John Elwyn, Cedric Morris, J.D. Innes, Morland Lewis and Evan Walters. But no doubt the wishes of the funders, the Heritage Lottery Fund in this case, had to be respected, and the painters’ time will come in the future. 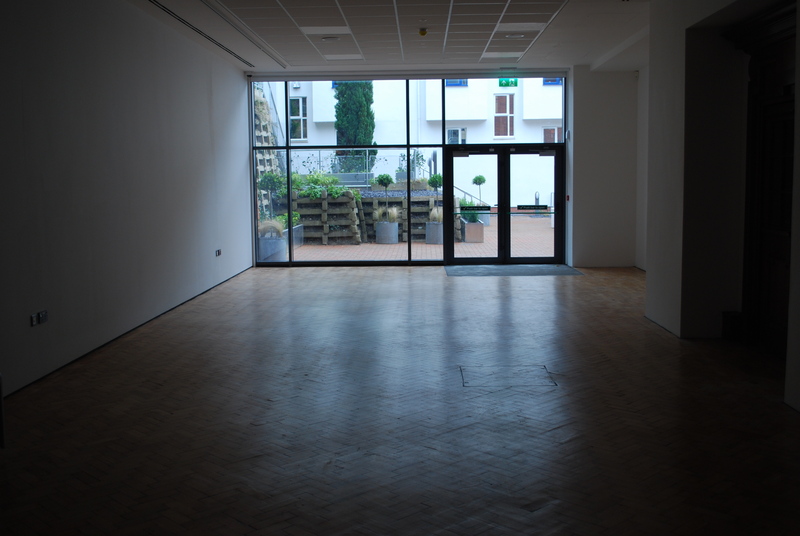 The gallery space in the 1970s extension is given over to mildly interesting conceptual and video works, by artists such as Mark Wallinger, William Kentridge and Oscar Muños. The captioning here is minimal (and difficult to read in the gloom). 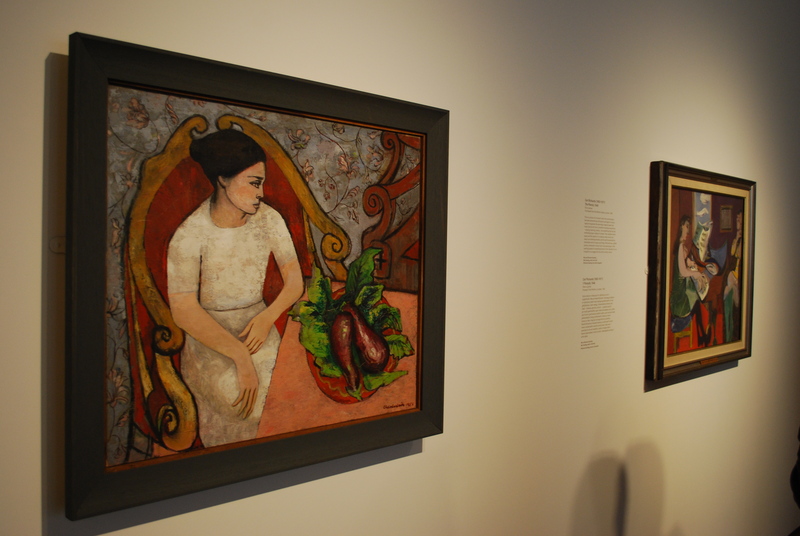 In Room 8 the captions are fuller and more helpful: the one for the Brenda Chamberlain explains the Picasso connection and draws an interesting contrast with Picasso’s own depictions of Dora Maar. Here in the extension the need for captions is more urgent, since as usual with conceptual art the idea comes ahead of its embodiment and needs some setting in context. Sitting as a kind of ironic gatekeeper to these works is another loan from the Tate, Marcel Duchamp’s La boite en valise (1963). This ‘limited edition’ is a commentary on the original/reproduction distinction, as well as a kind of final, playful summary-in-miniature of Duchamp’s entire artistic work. His pre-First World War work was, it seems to me, the last word on art of its kind. All but the most outstanding conceptual art produced since has been redundant. Duchamp himself recognised this by giving up making original art and devoting himself to chess playing. All in all, then, these first displays give us a great wealth of art – and a well-judged balance between different media, between contemporary and historical, between permanent collection and loans, between local and Welsh and international. There’s something here to suit everyone. 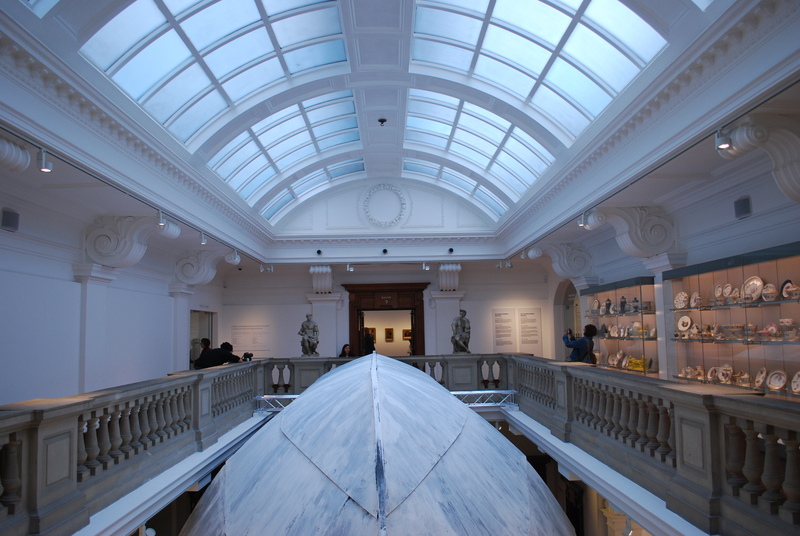 In the afternoon the Gallery was opened to all. Soon the whole of the building was flooded by people of all ages and backgrounds. Almost everyone had a smile on their faces. The grandees who spoke at the ‘official’ opening on Friday night trusted that the people of Swansea would flock to the Glynn Viv and regard it as their own. They needn’t have worried. More than that, there can’t be any doubt that local people will feel a huge pride in the Gallery, and especially in its high quality. That the quality is high is due not only to the architects, builders, project managers and many others, but primarily to Jenni Spencer-Davies and her staff in the Gallery. They’ve worked tirelessly and with commitment, imagination and ambition to make the Glynn Viv at once a magnet and an engine for the visual arts in Swansea and south-west Wales. The ‘new’ building – in fact, there is much that’s truly new behind the scenes, including additional storage and conservation space – will act as a springboard for them to achieve much more. Because the reopening of the Glynn Viv isn’t the end. 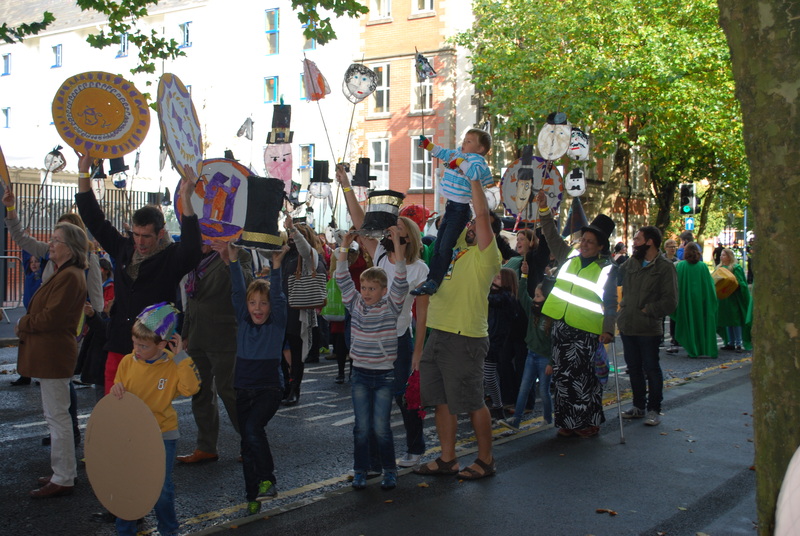 It should be the beginning – of realising Swansea as a real City of Art. Swansea will probably never catch up with Cardiff as a centre of political, economic and financial power. But it does have distinctive advantages, and art is one of them. The speakers at the official opening touched on many things, but not one of them drew attention to the explosion in contemporary visual art in the city in recent years – the increase in the number of studios, galleries, exhibition spaces and sheer artistic energy. 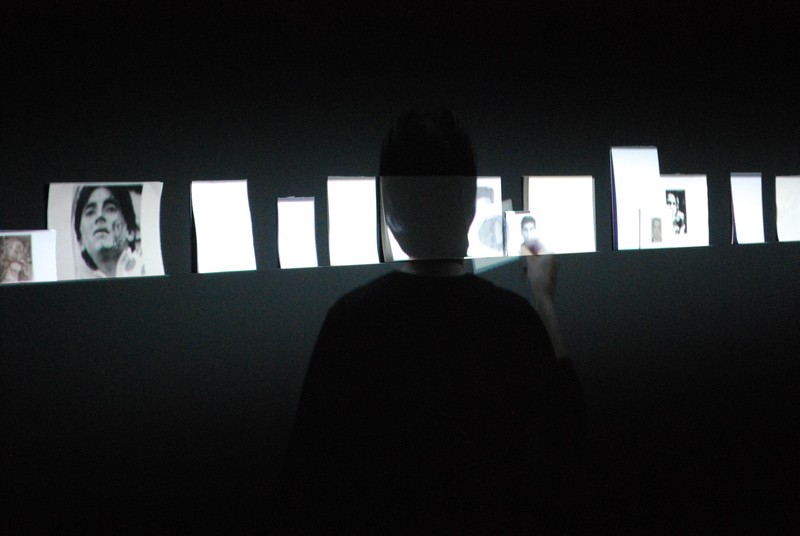 This growth – much of it has come from the grassroots, like Elysium Gallery and Studios, and Galerie Simpson – needs to be nurtured, encouraged, publicised. Swansea Council must play its part. The Council leaders talked a good talk, but they need to show practical commitment, and to develop a good strategy, to play their part. (One way of doing that is to maintain the current level of recurrent funding for the Glynn Viv.) But many others should contribute too. Has the time come, with the restoration of the Glynn Viv to Swansea’s artistic community, for bringing interested parties together in a collaborative forum, to see what practical things can be achieved?